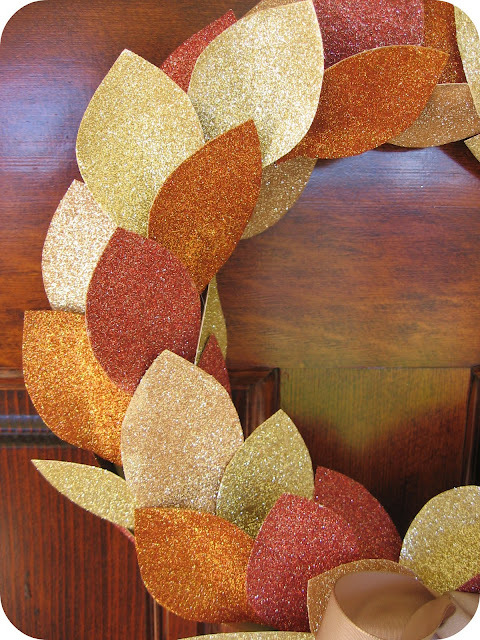 Homemade by Jill's blog has a great and very very easy DIY on how to make a glitter leaf wreath just in time for Thanksgiving! As seen on So You Think You're Crafty, Week 2! Thanks to everyone who voted for this project. 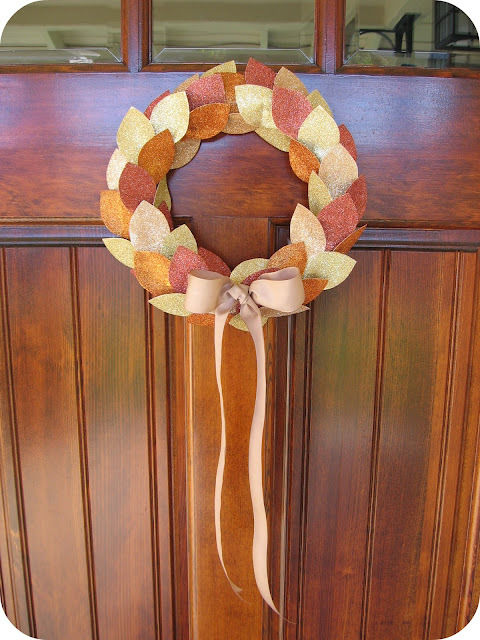 I know autumn is behind us, but it is so easy to customize this wreath in seasonal or holiday colors. It would be a great last minute (not to mention inexpensive) Christmas project, if you still need some decorations. 1. Cut out a basic leaf shape to use as your template. Cut out approximately 60 leaves out of cardstock. I used a 10 inch wreath form. If you are making a bigger wreath, you will likely need more leaves. 2. 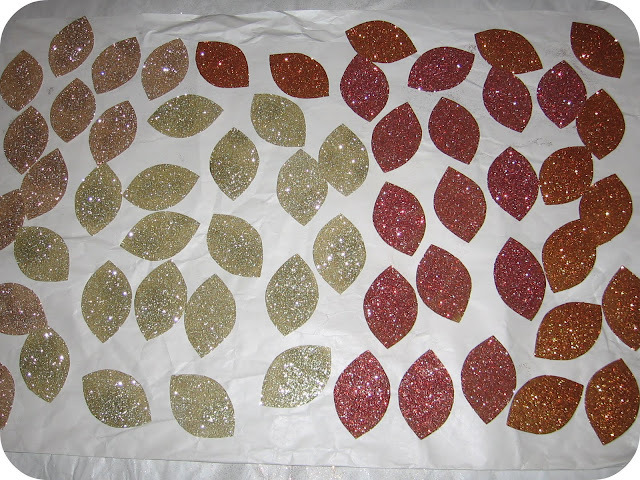 Divide your leaves into groups for glittering. Spray each group with spray adhesive and coat in glitter. Shake off the excess. 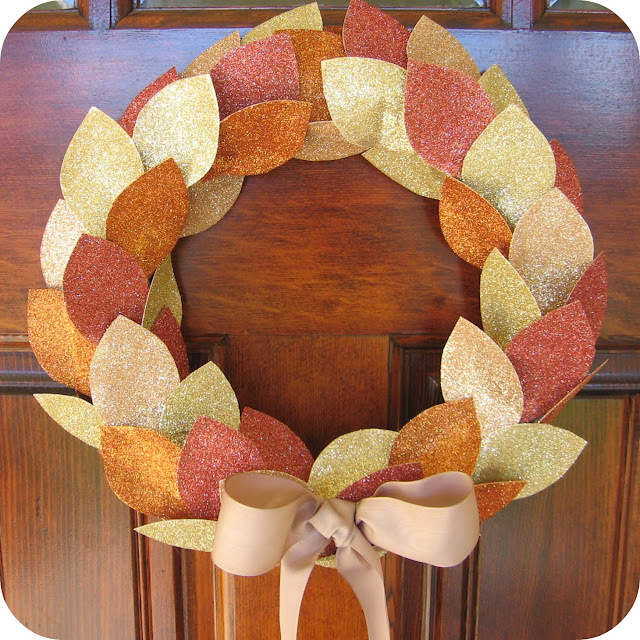 I used the following colors of Martha Stewart Crafts glitter for this fall wreath: Smokey Quartz, Yellow Gold, Cinnibar, and Fire Opal. For a holiday wreath, a selection of green glitters would look nice, especially with a big bow and some red jingle bells. For a wreath to last all winter, I'd choose a variety of white and silver glitters for a snowy effect. 3. Add a wire loop to your wreath form for hanging. 4. Begin hot gluing the leaves to the wreath form, overlapping the bottom tips. 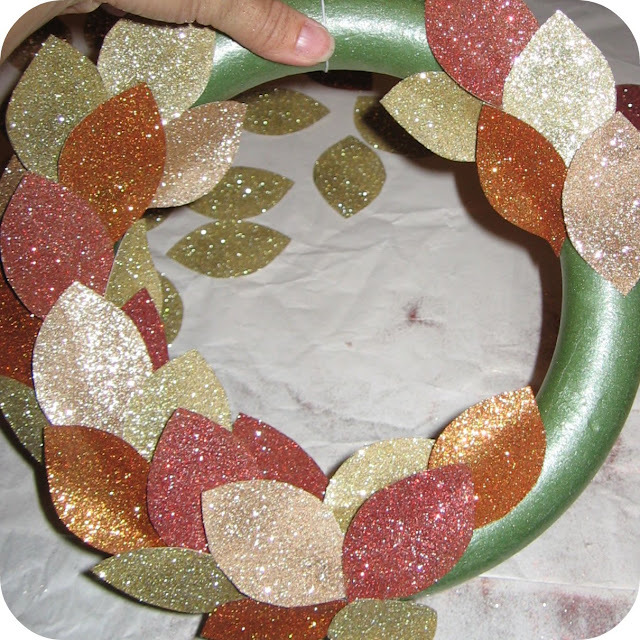 The hot glue gun will melt a styrofoam wreath form a little bit, but it holds well. 5. 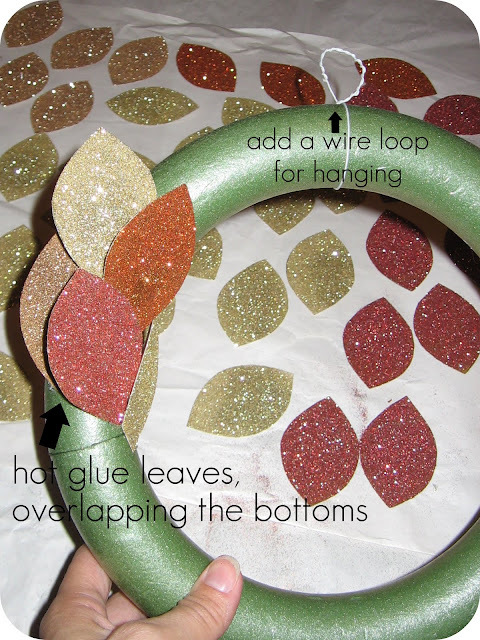 Continue gluing leaves around the wreath form. I changed the direction of the leaves at the bottom, but you may want to continue placing them in the same direction all the way around the leaf. 6. Attach a bow. 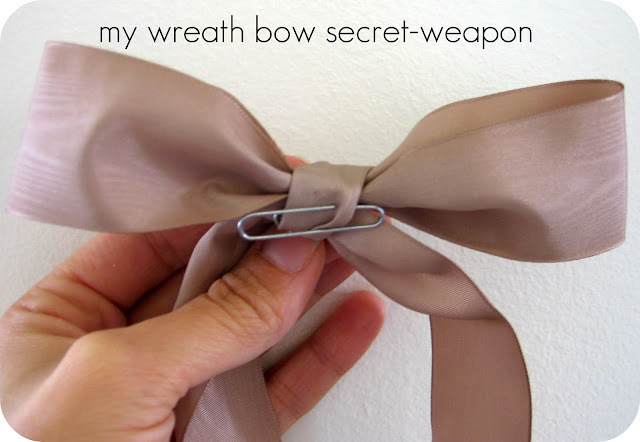 My secret weapon for attaching bows to wreaths is a paper clip (or maybe everyone does this and it's not such a secret?). Slide the small end of the paper clip though the back of the knot in your bow. Then use the large end of the paper clip to attach the bow to your wreath. This works especially well on a paper wreath like in this project, but I use this trick on all of my wreaths (it also makes it really easy to switch out your ribbons). Need a bow-tying lesson? You can find some tips at Martha Stewart.